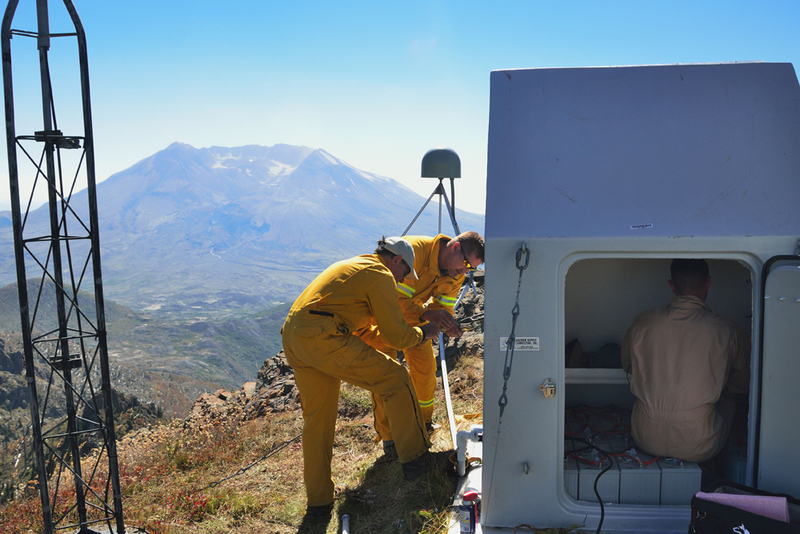 The Plate Boundary Observatory (PBO) is a network of more than 1,200 continuous GPS instruments, borehole strainmeters and seismometers, and tiltmeters installed primarily throughout the Western United States. 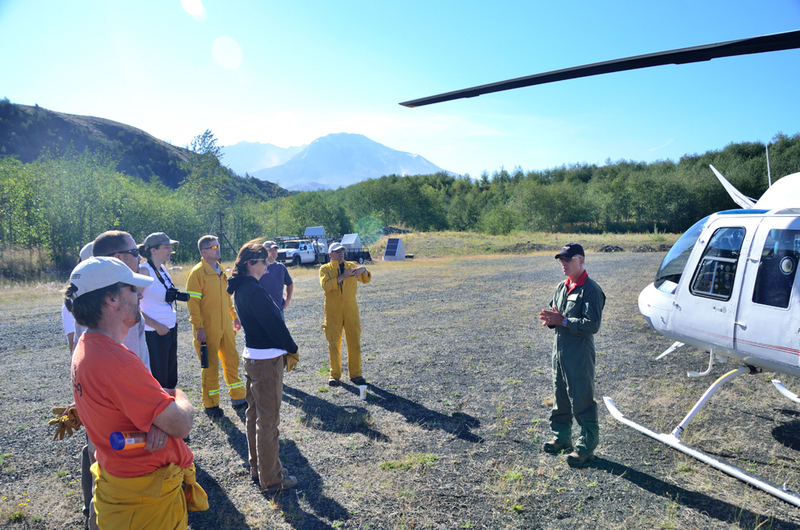 The objective of PBO is to explore land motions related to movement of the Pacific, Juan de Fuca, and North American tectonic plates; such motions inform us about earthquakes, volcanoes, tsunamis, and other hazards related to plate tectonics. 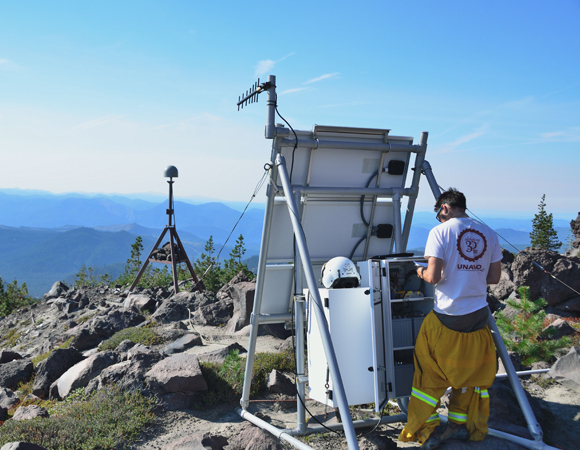 PBO is also used to remotely measure changes in water content of the troposphere, soil moisture content, snow depth, and ground motions related to changes in aquifers, droughts, and lake levels. 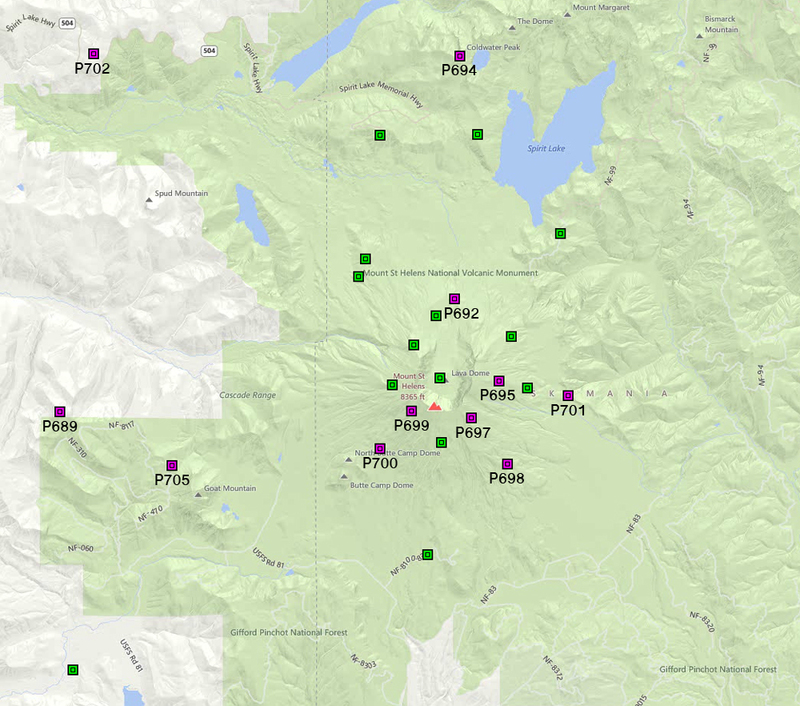 PBO is a major component of EarthScope and is funded by the National Science Foundation. 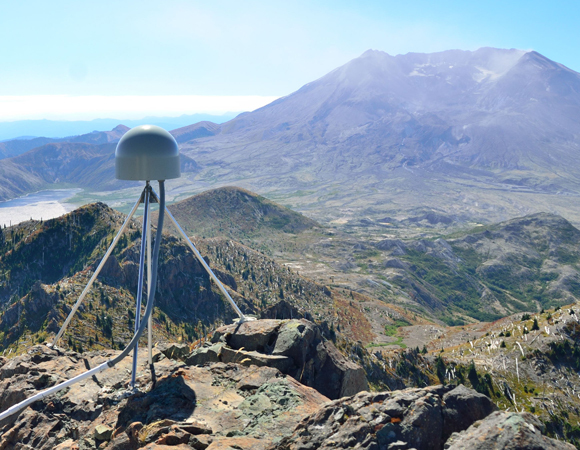 Continuous GPS stations at Mount St. Helens installed in collaboration with the USGS Cascade Volcano Observatory (CVO) help scientists monitor and better understand Mount St. Helens both for risk assessment and for applying new knowledge to other volcanoes worldwide. 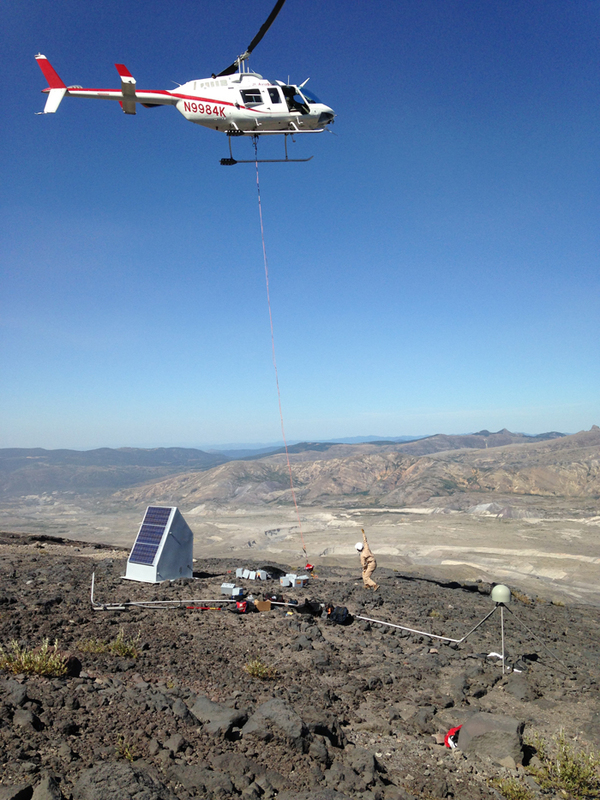 A total of 24 continuous GPS stations have been installed within 20 km of the volcano's summit. 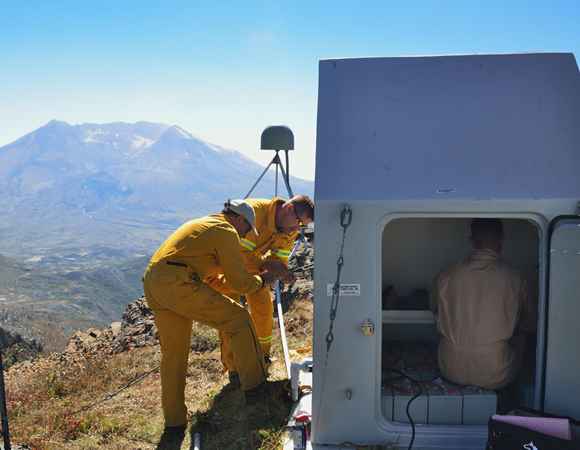 Seven of these stations are operated by CVO and the additional 17 are operated by UNAVCO as part of the EarthScope Plate Boundary Observatory. 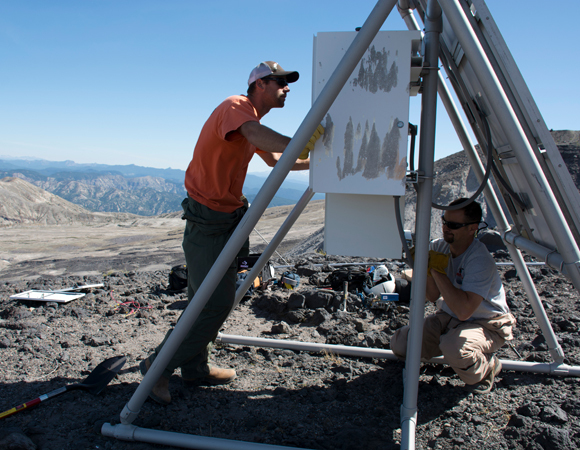 UNAVCO also installed and maintains 8 tiltmeters and 4 borehole strainmeters as part of the Mount St. Helens PBO sub-array. 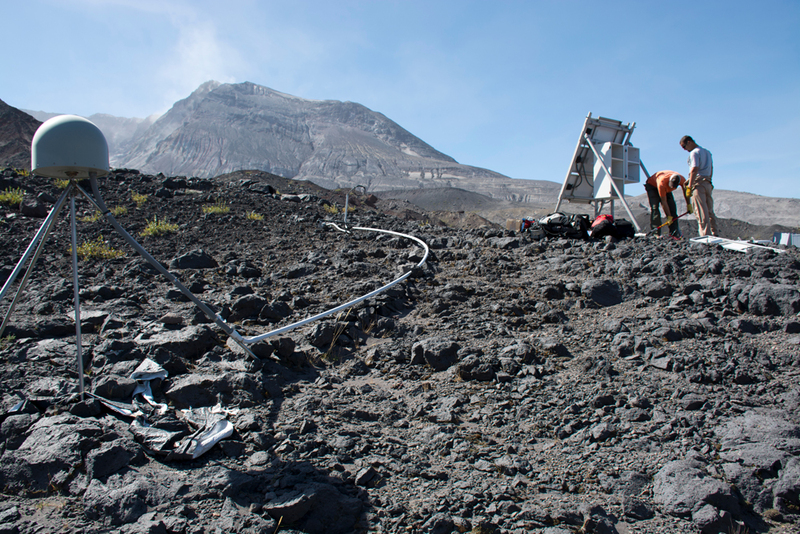 Installations began in October 2004, shortly after renewed activity at the volcano began. 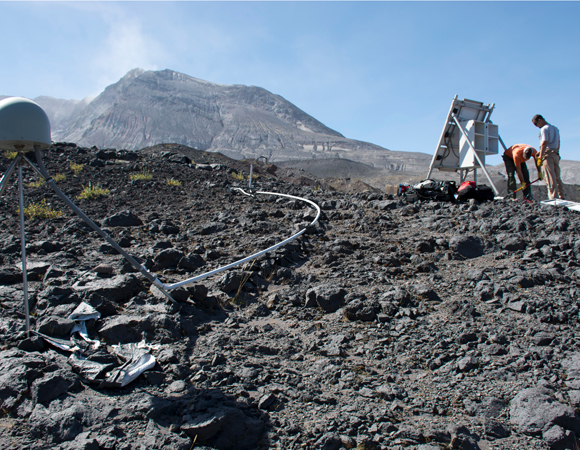 The PBO data have been critical to understanding the volcanic deformation associated with the eruption and its aftermath (see USGS Professional Paper 1750 Ch. 15). 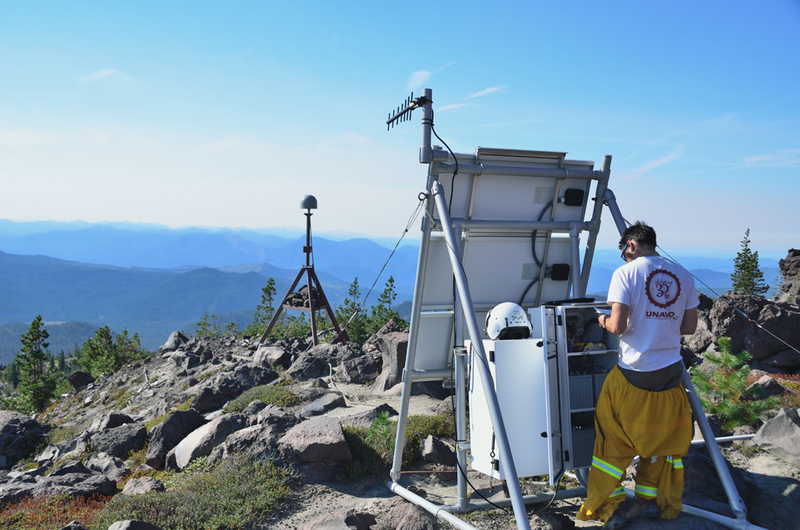 Because of extreme weather conditions, steep terrain, and risk of eruption, volcanoes are some of the most challenging places to install and maintain GPS stations. 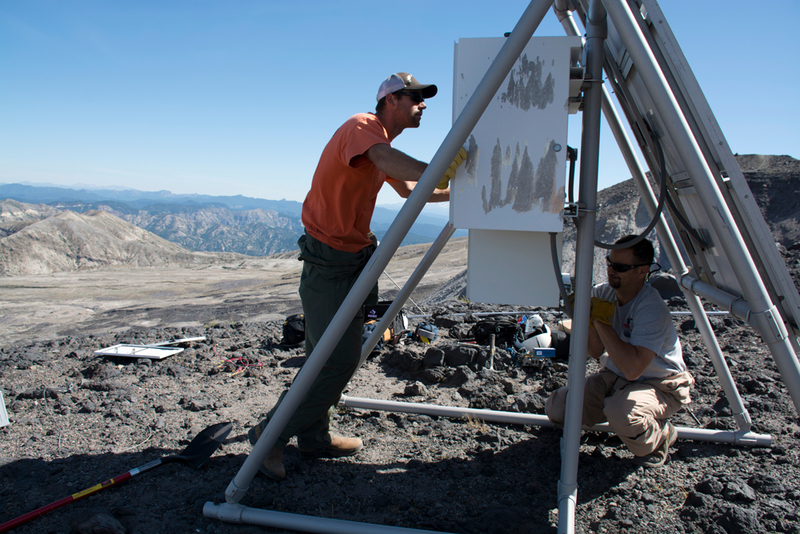 Winter snow load and limited site access are two major challenges in keeping stations running at Mount St. Helens. 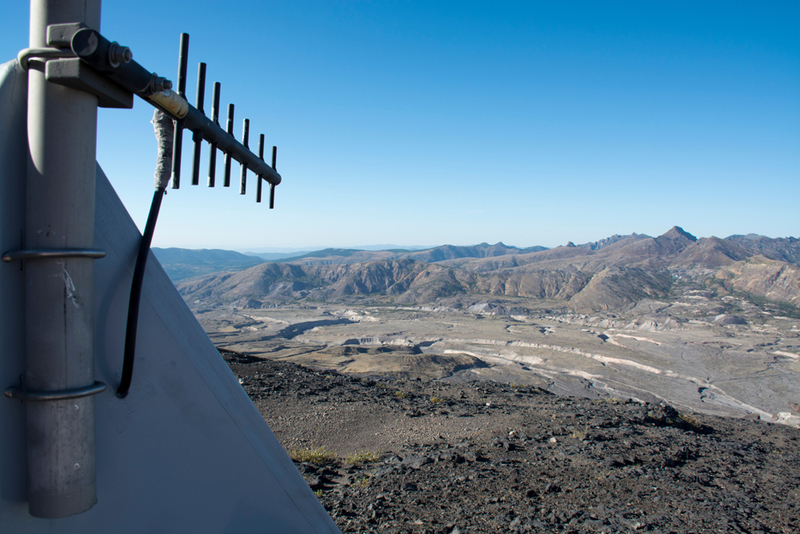 The September 2014 maintenance work focused on making three stations on the volcano more robust for transmitting data throughout the winter and bringing eight “silent” stations back online (see map, Figure 13). 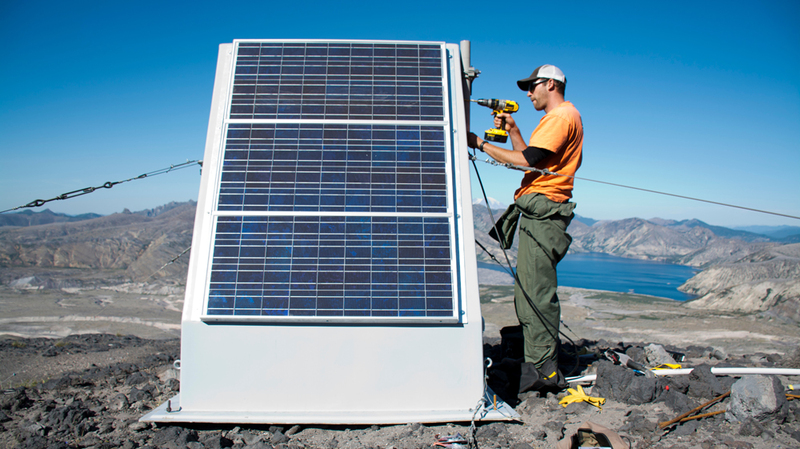 Power makeovers: Teams of two to four people worked to improve power supplies at three stations high on the volcano. 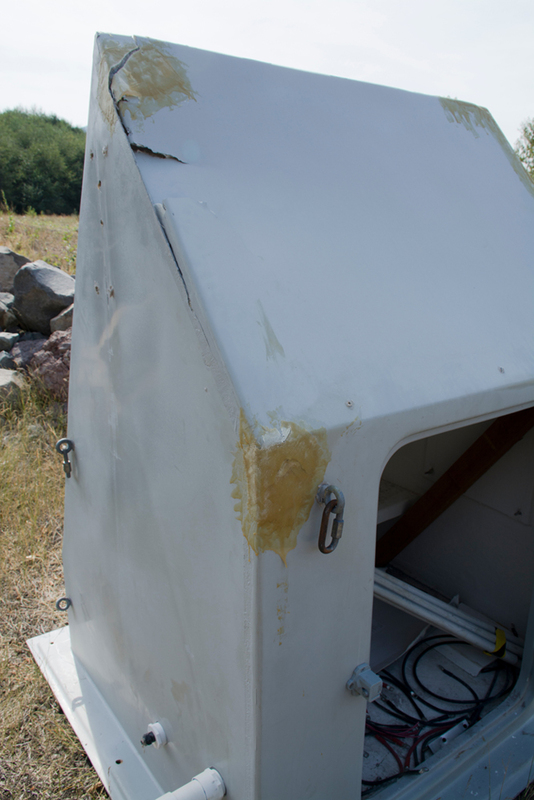 At P701 (Ape Canyon), P692 (Loowit Falls), and P694 (Coldwater Peak), 8-battery enclosures were replaced with 20-battery huts to ensure data collection through the snowy winter (Figures 4 and 6). 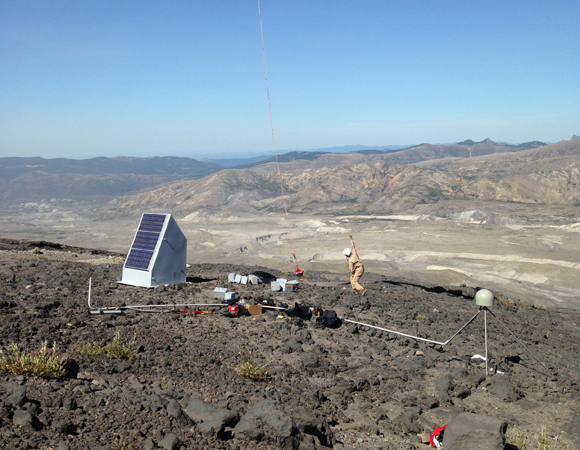 Each station was also equipped with a new GPS receiver (from NetRS to NetR9) and a new radio for data communications. 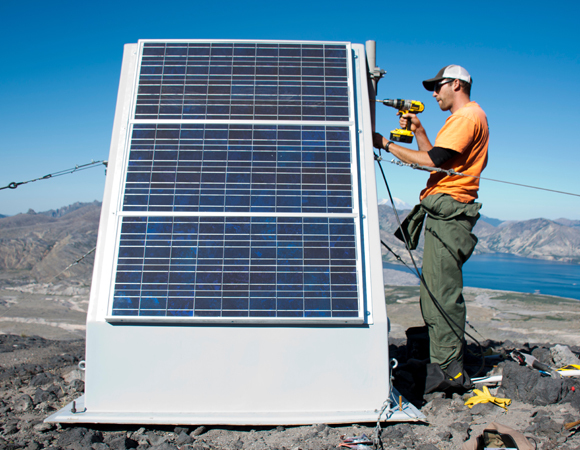 Radios, cables, and receivers: An additional seven stations required maintenance from new receivers to new radios to new cabling or lightning protection. 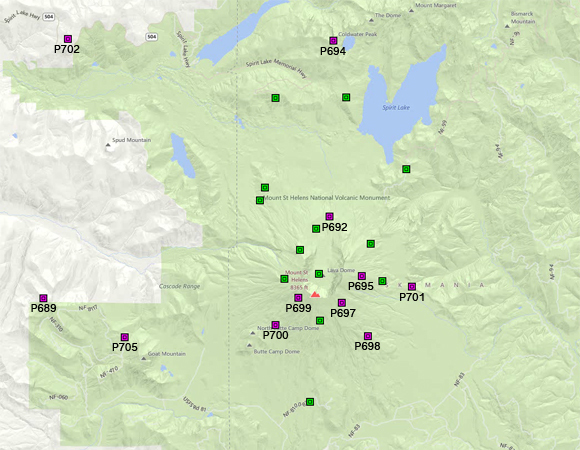 Stations visited included P695 (Nelson Ridge), P697 (Southeast Ridge), P698 (Southeast Slope), P689 (Flattop / Morgle), P702 (Elk Rock), P700 (Butte Camp), and P705 (West Goat). 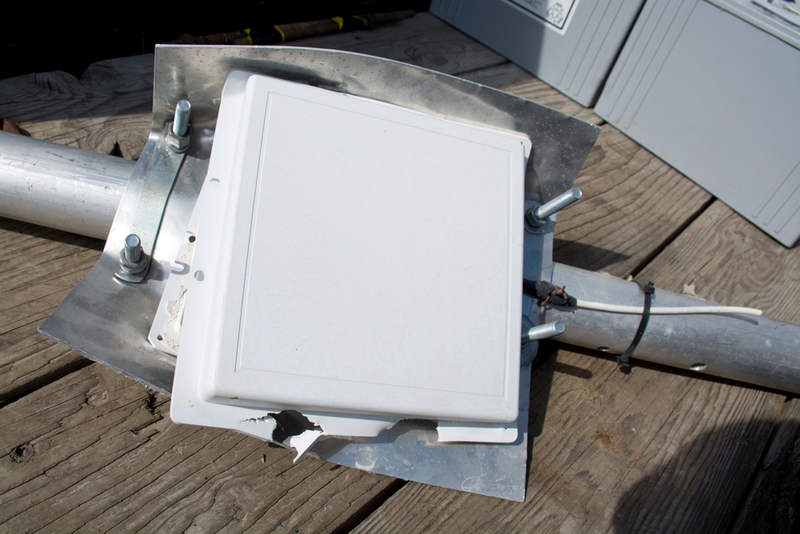 All stations were down at the time of maintenance with the exception of P700, which was operational but serves as a repeater for P705. 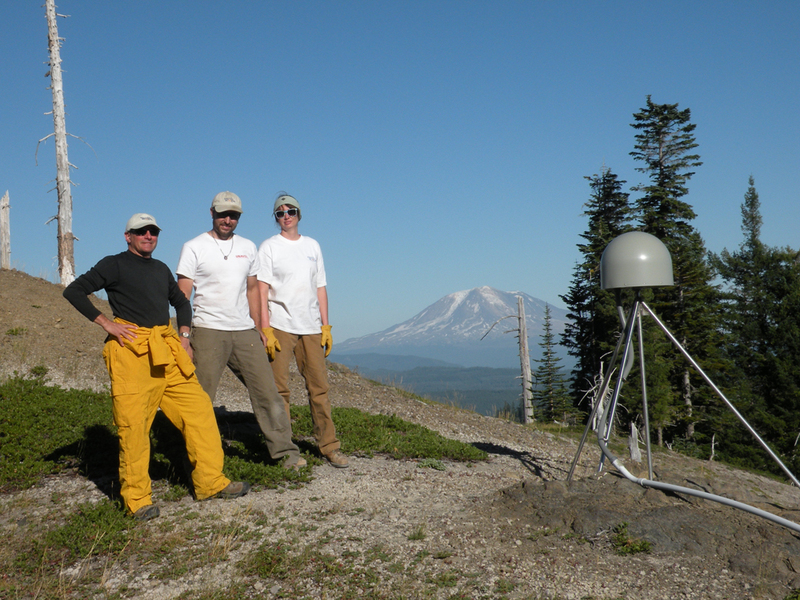 First decommissioning of a PBO station: UNAVCO decided in collaboration with the USGS Cascade Volcano Observatory (CVO) to decommission station P699, West Radial. The station was originally a CVO EDM tower. These mounuments have proven to be less stable than the drilled braced monuments installed later, and the data not as useful. 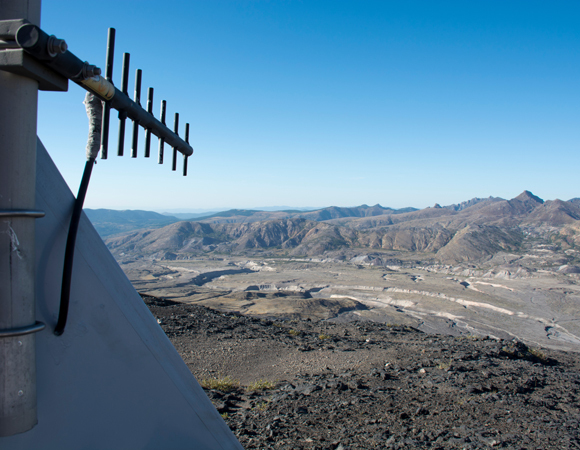 The station is also the highest on the southwest side of the volcano, and had already been rebuilt twice due to snow damage. 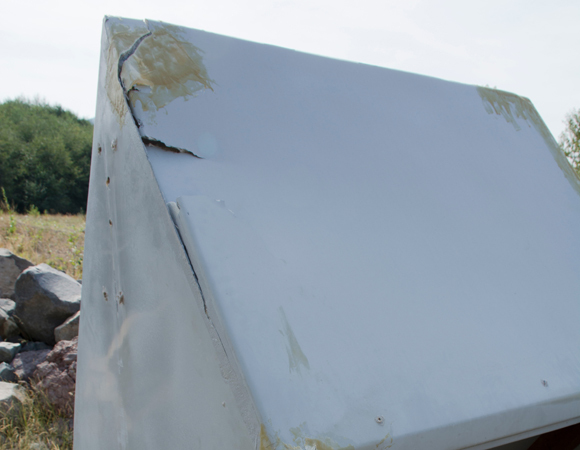 The field team arrived in September to find a crushed hut and radio antenna (Figures 10 and 11). 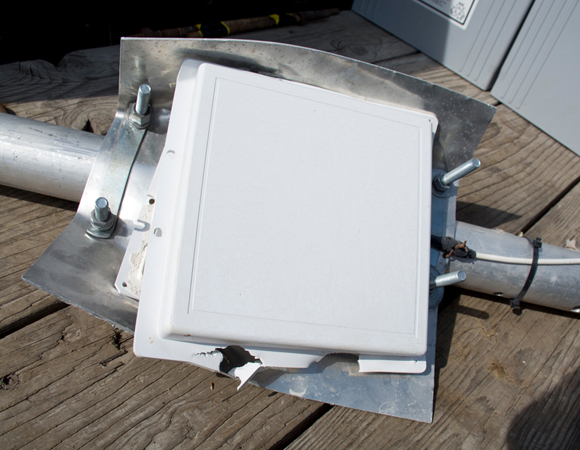 UNAVCO engineers removed the receiver and power infrastructure at the station but left the GPS antenna on the mount for future campaign GPS measurements. 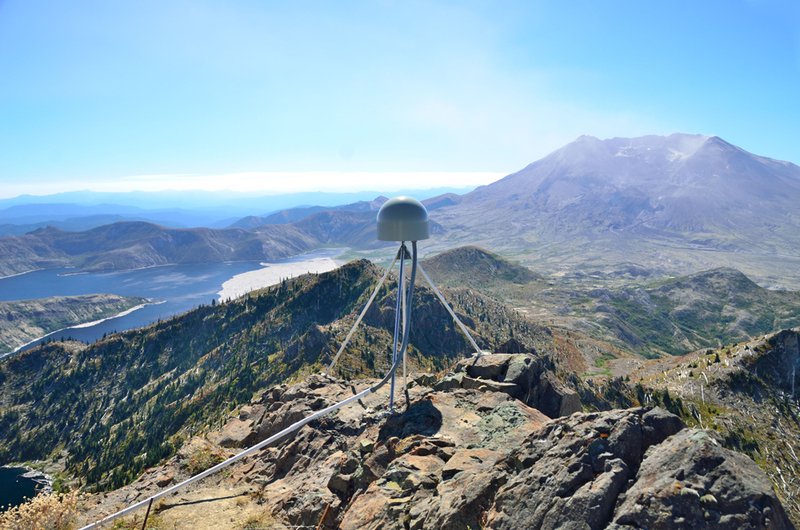 At the conclusion of September 2014 maintenance, all 17 PBO GPS stations on or near Mount St. Helens were operational and sending data to the UNAVCO Boulder facility. All data are free and open access. 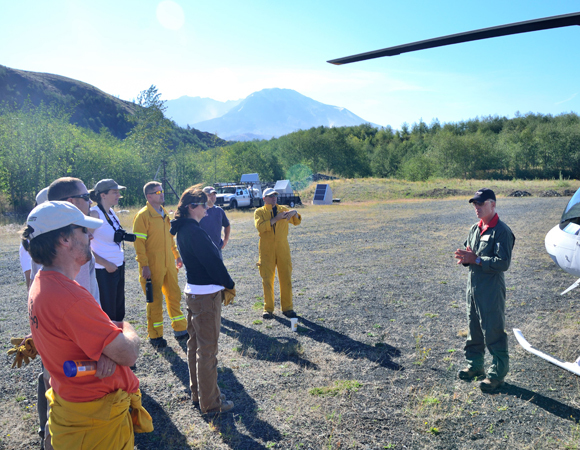 The September 2014 field team included Ken Austin, Glen Mattioli, Karl Feaux, Liz Van Boskirk, Mike Gottlieb, Chad Pyatt, and Beth Bartel (all UNAVCO), Russ Kelz (National Science Foundation), and Jeff Linscott and Dan Oller (both JL Aviation).